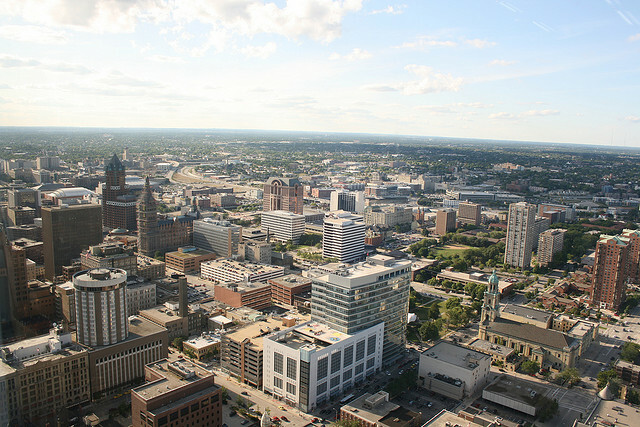 If you care about transit in Milwaukee, or if you simply want the best view of the city available, come to the 40th floor of the US Bank Center next Monday night, April 16th from 5:30 until 8:00 for a cocktail hour and discussion on the future of transit in Milwaukee and how we move through the city. The cocktail hour comes complete with a cash bar and appetizers. The event will be held in the offices of Foley & Lardner on the 40th floor of the US Bank Center, the tallest building in Wisconsin. If you’re able to pry your eyes away from the windows, a panel discussion will follow the cocktail hour moderated by Alex Runner, with panelists Alderman Robert Bauman, Alderman Nik Kovac, and myself. The panel will begin with a focus on the Milwaukee Streetcar project, but there will be ample time for the audience to ask questions. The event is free, but you will need to be in before 6 p.m. to gain access. Please RSVP via our Facebook event, or on YPWeek.com. We hope to see you there, and at other Young Professional Week events. Milwaukee’s first Young Professional Week is being led by NEWaukee. If you’re looking for Wednesday’s regularly scheduled Eyes on Milwaukee column, it will arrive on Thursday. I’m conducting research on how easy and enjoyable it is to take the Amtrak Hiawatha to Wrigley Field to watch the Milwaukee Brewers stomp the Chicago Cubs. Love the Amtrak research you’re doing. You might ask a few people in Chicago if they’ve ever done it the other way around. Not quite as easy, but doable! @Hyrax Suzuki After Cubs @ Brewers games you will see tons of Cubs fans at the Intermodal Station waiting to head home. How did the transit discussion go? @Chris. Fun really… BIG crowd, heard they had to turn away a ton of people….